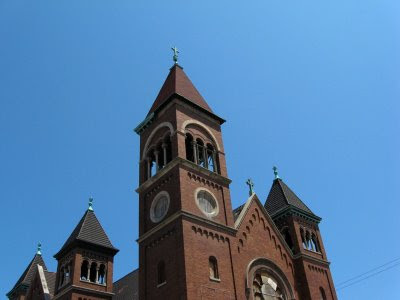 East Village Association | West Town Chicago: St. Boniface preview: Another date with wrecking ball? St. Boniface preview: Another date with wrecking ball? Closed for nearly two decades, St. Boniface Church again is in danger of demolition. The Roman Catholic Archdiocese of Chicago rejected a purchase offer from Egyptian Coptic Christians and in December put the site at Chestnut and Noble on a three-month track toward demolition. When the Roman Catholic archdiocese attempted to tear down the church and school nearly a decade ago, EVA fought for its preservation. Its research traced the parish to German immigrants who first developed West Town. Its buildings were the design of Henry J. Schlacks, a noted church architect and director of Notre Dame's architecture program. The school was razed in 2003. According to a Dec. 17 Chicago Tribune article, Egyptian Coptics offered a $100,000 donation to take over the 104-year-old church for a renovation partly funded by supporters in Egypt. The archdiocese had been seeking upwards of $2 million. Pledges to work toward resolving the conflict have come from Ald. Walter Burnett (27th) and Jonathan Fine, executive director of the group Preservation Chicago, who led the EVA preservation initiative in 1999. "From what I have been able to find out from the Planning Department, their proposal was woefully incomplete; their words not mine," Fine said. "I have requested that the Coptics resubmit their proposal so it addresses all of the concerns that the archdiocese raised and provides missing information."